Mark Oldman's entrepreneurialism incorporates wine, the start-up world and both coasts. Mark Oldman is one of the wine world's great popularizers. In his lectures, seminars and books - the most recent of which, How to Drink Like a Billionaire: Mastering Wine with Joie de Vivre, came out last fall - he encourages his audience to try unfamiliar grapes, relax about food and wine pairings and enjoy wine rather than make a fetish of it. Oldman's engaging breeziness can divert attention from his encyclopedic knowledge of wine, which he's acquired by following a path at once entrepreneurial and impassioned. Oldman, 48, grew up in a New Jersey and had no particular interest in food or wine when he went to Stanford University in 1987. During a semester at Oxford, he became part of the Oxford Wine Circle, a student group that is able to attract some of the world's great winemakers to come to campus. Upon his return to Palo Alto, Oldman started a similar similar group at Stanford, which is about 90 miles north of Napa Valley, and got people like Robert Mondavi, himself a 1937 Stanford graduate, to speak. "About 80% of the students wanted to learn, and 20% just wanted a good drink," Oldman says of the group, which lives on at Stanford's business school. "It was a lesson in marketing. The brand loyalties are still there," as many erstwhile Wine Circle members continue to buy from producers they first encountered as students. Oldman's hustle was not limited to wine. An obsessive reader of college guidebooks, he wondered why there was nothing similar for internships, and he and his Stanford friend Samer Hamadeh wrote a business plan for a book on that topic. "There was an entrepreneurial sense there," Oldman says of Stanford, noting that even as an English major he knew of William Hewlett and David Packard, who founded Hewlett-Packard Co. in a Palo Alto garage and became idols to generations of Stanford engineers. After getting his undergraduate degree from Stanford in 1991, Oldman picked up a master's degree in English and a law degree while teaching wine classes and working on the book project with Hamadeh. In 1995, they published The Internship Bible, which appeared just as the internet was taking off and message boards began serving as forums for gossip about employers. The book led to a contract with Houghton Mifflin to write a series of career-oriented books that served as a launching pad for Vault.com Inc.
That success helped Oldman land a spot on Stanford's Board of Trustees in 2000, where he met Burton McMurtry, one of Silicon Valley's most successful venture capitalists and a serious wine collector. "Almost everything I know about Burgundy comes from drinking with Burt and his family," Oldman says in a Chelsea loft that contains empties of some legendary Burgundy producers. Despite the depth of McMurtry's collection, "he's quite casual about wine, and he has great generosity," Oldman says. "His impulse is to make moments for people with wine," an approach Oldman has tried to follow. Oldman joined Stanford's board just as the dot-com boom was ending, and the resulting crash was challenging for Vault.com, which like many of its peers had to lay people off. 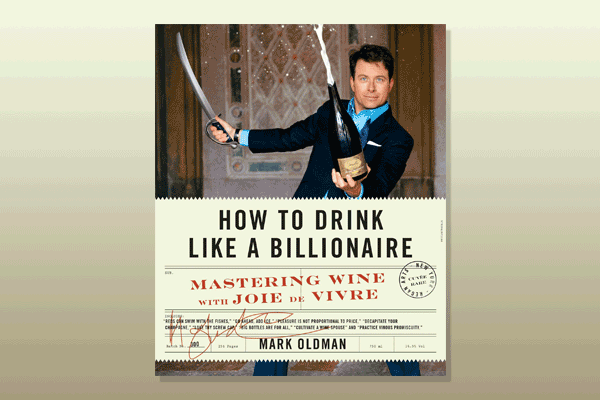 Oldman coped in part by writing what would become his first wine book, Oldman's Guide to Outsmarting Wine, which came out in 2005 and is now in its tenth printing. He and Hamadeh sold control of Vault.com Inc. to Veronis Suhler Stevenson LLC for between $60 million and $85 million in 2007. Oldman published his second book, Oldman's Guide to Outsmarting Wine three years later, and he's made a career of being a wine impresario by speaking at food and wine conferences, consulting with collectors and teaching private classes. It was a natural transition, Hamadeh says. "Vault.com provided a penetrating, iconoclastic look at companies and careers," he says. "We were tireless and passionate about career information. Mark has done the same for wine: breaking down wine connoisseurship and uncovering wine secrets for a wider audience." The variety of assignments Oldman takes on forces him to learn about a wide array of regions and grapes and gives him the versatility to discuss wines from all over the world. It also fits his personality. "I'm a bit of a restless spirit, " he says. "You have to have faith that what you're doing can be reincorporated into the rest of your life."